The man reportedly arrested in the aftermath of a shooting spree in Mesa, Ariz., today sports tattoos that identify him as a neo-Nazi. What's more, a local retired detective says he is a longtime white supremacist skinhead associated with major racist groups. 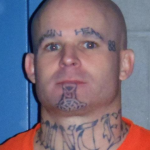 The Arizona prison system's mug shot of Giroux shows his face covered in white supremacist tattoos: where his shaven eyebrows used to be, the words "SKIN" and "HEAD"; and on his left temple, the number "88," which is neo-Nazi code for Heil Hitler (because H is the 8th letter of the alphabet); and, on his chin, a "Thor's Hammer," a symbol used by adherents of Odinism, a pre-Christian faith that has been adopted by many white supremacists. A retired Mesa Police detective who once infiltrated local skinhead groups told Hatewatch that he knew Giroux from previous encounters, and that Giroux was a member of Hammerskin Nation, a notoriously violent racist skinhead group, and an associate of the Aryan Brotherhood, a national prison gang with a long list of murders to its credit. "He's a violent guy," said the former detective, who knew Giroux as a young skinhead in the 1990s and early 2000s . "I think his time in prison contributed to that." According to early reports, the rampage apparently began before 9 a.m. at the Tri City Inn, a Mesa motel, when three people were shot in a room by the suspect. One of those, a male, died at the scene; two women in the room were wounded by the shooter. The suspect then apparently ran across the street to a nearby bistro café and shot a man there. That victim then ran across the street to the motel, where medical personnel had arrived to treat the first victims, and he received treatment there. The shooter then hijacked a car from a woman at the parking lot of an adjacent technical school and drove down a nearby boulevard for about a mile, and then pulled into a large apartment complex. Once there, he apparently shot and wounded a man outside in the parking lot. He then crossed the street to a nearby apartment and broke into it. The occupant of the apartment he invaded was left unhurt. About two hours after the rampage began, Mesa police successfully cornered Giroux and captured him with the use of Tasers. He was led away from the scene in a DNA suit designed to preserve evidence on his person. During the search for Giroux, officials at nearby Adams Elementary School put the school on shutdown, and officials at nearby Pima Medical Center similarly locked down their facility. After his arrest, there was a flood of cars from the area as people who had been put under lockdown fled, and parents arrived to take their children home from the school.